In Part 1 I described how I use automated tests to fire up Selenium, hit a webpage, and log errors to ELMAH via jQuery. But with an elaborate test harness scenario like this, I argue that the onus should be squarely on the JS side to prove itself. I'll show you what I mean. 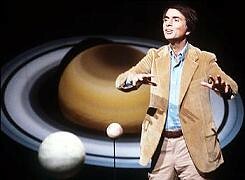 Carl Sagan (Cosmos), by trackrecord. Carl Sagan was the man. One of the advantages (as I see it) of the co-opting of ELMAH error logging into my automated tests is that errors end up where they should, in ELMAH. As in, in the "ELMAH_Error" table in your database, or whatever back-end storage option you choose. Because you are using ELMAH, right? (At this stage it probably looks as if I'm keyword spamming for "ELMAH". Oops, said ELMAH again.) Some might see this as noisy, an adulteration of the logging stream for your application's unhandled exceptions, but if I'm going to use my database to coordinate my automated test sessions, then the ELMAH table is the most natural place to put it. And if you don't want automated test kruft there, you can easily identify it and filter it out later. Or at the end of the test. Or hire a cleaner if you're too busy. Automated test and JS errors go to ELMAH to die. Might wanna fix up those Google+ errors! Of course, there's a few different ways you could do all this. Maybe a cookie. But I think this is the easiest. A couple of times on outings with Tina, my wife, I've said something like "You go to that shop, I'll go to this one, and I'll text you if there's a change of plan, otherwise I'll give you a missed call, and we'll meet at such-and-such a place, and if that's closed, I'll text you where to meet." Too many moving parts. And we've come unstuck one or two times because of it. Phones and batteries don't always work. Same for (my) short-term memory. This testing technique has, as it stands, too many moving parts. It relies on a few things working. 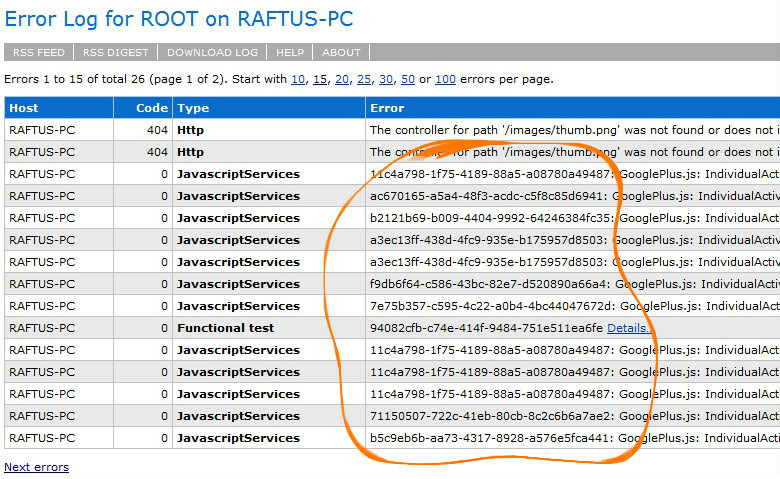 For instance, it relies on the fact that the JS file is correct, that the controller and Razor between them are serving up the test page with the meta tag containing the session id, etc. To that end, you could assert that the page is serving in the first place by adding in a HttpClient check to see if all is OK, that is that the Http Response Code is 200, because if it doesn't respond with 200, I don't have a page. // serves OK in the first place? Fine, the page serves OK, but there's still plenty that could have gone wrong. Like the JS file didn't load. Or it did, but some bug happened and the testing didn't happen. So you get a false negative, a Type II error. Something went wrong, but you didn't spot it, and everything looked like it worked. Even though the thing that went wrong might have had nothing to do with the actual case you're trying to test, in an automated test, you need to know that the test is broken, or else it has no value whatsoever. So, the null hypothesis (denoted H0 by statisticians, so now you know) is that the test will fail. Or rather, will stay failed, since I've changed the test to log an error as part of its setup, and the rest of the test must clear that error. This is because it is the simplest option: there are many ways for this flaky arrangement of test class/rigged-up HTML and Razor/JS/Web API and ELMAH to fail, and only one way for it to succeed. So I engineer the initial conditions to create an error, then challenge the rest of the test harness - the JS, HTML, ELMAH etc - to prove me wrong. Now, if it doesn't get to the JS, it can't clear the error, and the automated test fails. Or, it makes it to the JS, but something happens there. Or in the Web API controller. There is no chance of a false positive, a Type I error. There's simply no way an accidental success can fall through the cracks. The JS file is just an instruction to run the tests, checks to see that the divs have loaded content from the public APIs they're supposed to, and then if all is well an instruction to delete the original error token.